Most people will tell you that mint is so easy to grow and becomes a weed. Oh how I’ve longed for that problem. And I finally have it. After a few failures, my mint has finally found a permanent home and I’ve got more than I know what to do with! 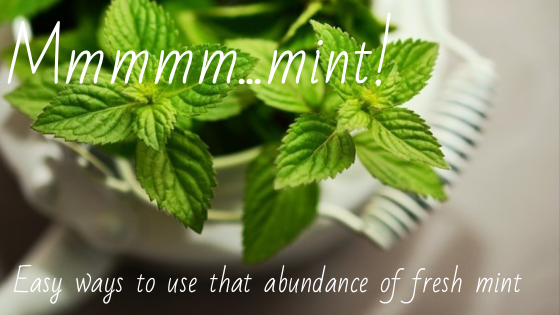 Fresh mint is ….. inimitable. There’s nothing else like it and nothing can replace it. Mint adds a touch of summer and can dress up the simplest of dishes, as well. Herbally, mint is known to aid in digestion. So it’s an easy remedy for mild tummy upset and one that goes down pretty easily with kids. I think we all know we can add mint leaves to our tea or make an all-mint tea pretty easily. I wanted to find some new ideas for fresh mint, mostly culinary and kid-friendly. And my typical caveat – they must be EASY. Minted fruit. Super easy. Just add fresh chopped mint to ANY fruit. It really takes it to a new level. I love it on mango or peaches, especially, with a squeeze of lime. Any berries do well this way, too. Even try it on cooked applesauce or baked apples. It works on anything: strawberries, melons, grapes, pineapple, watermelon, whatever you love or (often in my case) whatever is on sale. Similarly add to your favorite smoothie. Great with fruit, but also a chocolate one. Mint sugar or honey. Infuse cleaned and dried mint leaves in either. GREAT in your tea and even baked goods. Or use it to make Mint Whipped Cream. Oh yeah. Mint lemonade. You can make a simple sugar first or just steep it in the lemonade. OR use your mint sugar in the lemonade recipe. Mint Cheese spread. Add it to cottage cheese or cream cheese and spread on crackers or bagels. Mint Syrup. Make a batch and then easily add to lemonades, teas, hot cocoa recipes, ice cream and more. Oooo try it in coffee! Steep your kombucha tea with mint far an EASY flavor variety. Add it to almost any medicinal tea to help the kids take it. Add it to homemade popsicles. Pretty AND refreshing. Serve a hefty bunch next time you serve noodle soup. Try adding some to your next cabbage slaw recipe. Overrun with mint? Dehydrate it or make mint ice cubes so you can enjoy it later. Several of the above ideas work with dried or iced mint. Or just share the love with a neighbor and you both can enjoy the blessings mint offers. Previous Post:beach toes with a color street pedicure + giveaway!